Gale XV is a figure photographer and collector based in Toronto, Canada. 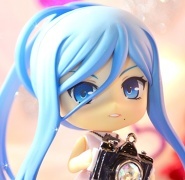 His main subjects revolve around nendoroids, prize figures & scale figures, either taken within a diorama set or outdoors. His photography themes vary from fantasy to slice of life, as he experiment on different styles of sets and lighting.